March Madness is fast approaching. If you’re planning on planting yourself in front of a TV for the duration of the tournament, you’ll need the right equipment—and some sustenance. 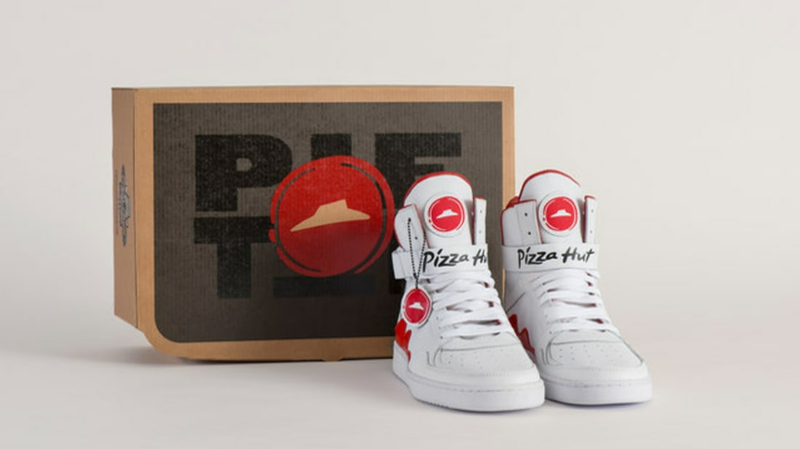 Enter Pizza Hut's "Pie Tops," a pair of branded smart sneakers that can request a pizza delivery to wherever you're wearing them with just the press of a button, Thrillist reports. The promotional product ties in with the NCAA tournament taking place from March 14 to April 3. But these stylish kicks aren’t for running up and down the basketball court; Bluetooth buttons embedded in the shoes can be used to place instant pizza orders. When wearers press the Pizza Hut logo on the tongue, the shoe connects to their smartphone and purchases an $8 large supreme pie (owners can change this default setting to the pizza of their choice). Wherever they’re standing when the order is made is where the delivery will end up. There are just 64 pairs of sneakers to go around and, according to Engadget, the chain will distribute them to the public “at some point in the future.” Lucky recipients might consider supplementing their wardrobe with more Pizza Hut-branded apparel to complete the look.